Kathakali aims to broaden palates with Indian cuisine from the coastal region of Kerala. Clockwise from top right: Kerala meen curry, meen pollichathu, chakka potato stew, nalla maolagu chicken curry and crepe-like aappam. Just because Kathakali serves your go-to butter chicken doesn’t mean you should order it. There are better, bolder, more interesting flavors to be had at this Kirkland Indian eatery, which opened last April. A short drive from Kirkland’s cute downtown, but within walking distance of the lakeshore, this standalone restaurant (which, from the outside, looks like a former fast food joint, complete with ample parking) has been reimagined as a cheerful, modern space by its co-owners, Ramya Balachandran and her husband/chef, Ajay Panicker, with his longtime friend Srinivasan Anandhakumar. The couple are seasoned vets: They’ve been running the wildly popular neighborhood restaurant Aahaar in Snoqualmie since 2012. Balachandran points out that most local Indian restaurants serve the same handful of northern Indian dishes, such as palak paneer and chicken tikka masala, but Aahaar’s success with southern Indian dishes—primarily from the state of Tamil Nadu, where Panicker grew up and learned to cook—has proven there’s an appetite for such dishes here. At Kathakali, the focus of the menu are dishes from Tamil Nadu’s neighboring state, the small coastal region of Kerala. Seafood is a must: Order the meen pollichathu ($18), a sea bass fillet cooked to fall-apart tender, with finely chopped tomatoes and onions, ginger, garlic, green chiles and curry leaves, all wrapped in a banana leaf. The sleeper hit of our meal was the aappam ($8), which is easy to overlook in favor of the broad menu of excellent crepe-like dosas. 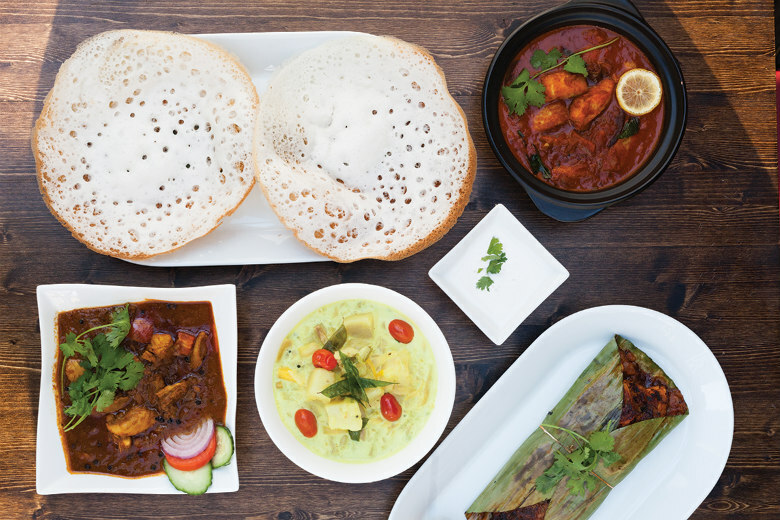 An aappam is similar yet different in delicious ways: a lacy crepe made of fermented rice and coconut milk that’s still a bit wobbly in the center, gently sweet to offset the unapologetic heat of nalla molagu ($15), a complex chicken curry. Speaking of heat: There’s no star system in place here; dishes are served as they’re meant to be eaten, which often means they’re quite spicy. If that’s a concern, ask your server for help in ordering. Fans of Aahaar have been begging for another Eastside location for years, and Balachandran and Panicker have delivered. There’s talk of a fine-dining Indian restaurant next, maybe on Capitol Hill, but that’s just a pipe dream—for now. We can’t wait. Anything with jackfruit, the meaty exotic fruit made savory in dishes such as chakka potato stew ($14), or sweet in the house-made chakka ice cream ($6).